We’re excited to take ZipList a step further by working with AOL to make grocery shopping and meal planning less of chore for their millions of users, as well as further our vision of a universal shopping list and recipe box. ZipList today announced a strategic relationship with AOL's (NYSE: AOL) KitchenDaily website to integrate its free online shopping list and recipe box platform. In the coming months, ZipList plans to integrate the service into AOL's food blog, Slashfood, and paperless coupon service, Shortcuts.com, expanding the range of sites across the web where users can access their single online grocery list and recipe box. Starting today, AOL’s KitchenDaily users will be able to add ingredients to their shopping lists and save any of KitchenDaily’s recipes to a single, universal recipe box with one click. They will also be able to add any other grocery items they need for the week to their online grocery list, which can be accessed at KitchenDaily.com, ZipList.com or on a variety of other apps and sites across the web. ZipList enables users to create and share lists on the web or on iPhone and Android apps, as well as by email, instant message or text message. Users can also organize items on their shopping lists by aisle for each of their stores, making shopping more efficient by reducing back-tracking through the store. In February, the free ZipList online shopping list and recipe search service was made available to the public. 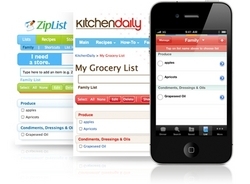 At the same time, ZipList announced integration into recipes across MarthaStewart.com, as well as into “Martha’s Everyday Food™,” a recipe and grocery list app for the iPhone and iPod Touch that seamlessly syncs with http://www.ZipList.com for shared web access. ZipList offers consumer packaged good manufacturers (CPGs), media publishers and grocery retailers the opportunity to directly embed its functionality into their websites, enabling consumers access to their single, personal grocery list while staying within a fully branded experience. Its fully integrated mobile capabilities allow partners to offer an integrated online and offline experience, even while consumers are in the store. Interested partners can contact ZipList at partners@ziplist.com. ZipList is a free, easy-to-use online and mobile shopping list and recipe search service that enables shoppers to create and share grocery lists with family members. Users can arrange their lists by aisle or store, and can save recipes to a central recipe box. ZipList has partner tools available to enable media and lifestyle properties to incorporate shopping list and recipe box features into their own sites. ZipList features can be found on MarthaStewart.com and AOL’s KitchenDaily.com, among other websites. ZipList is on the web at http://www.ZipList.com. Check out the ZipList blog at http://blog.ziplist.com for the latest recipes, product updates, money-saving advice and grocery shopping tips. Follow ZipList on Twitter at http://www.twitter.com/ZipList or become a Facebook Fan at http://www.facebook.com/ZipList. ZipList is also available as a free mobile app for iPhone and Android users. For more on these mobile apps, visit http://www.ZipList.com/apps.